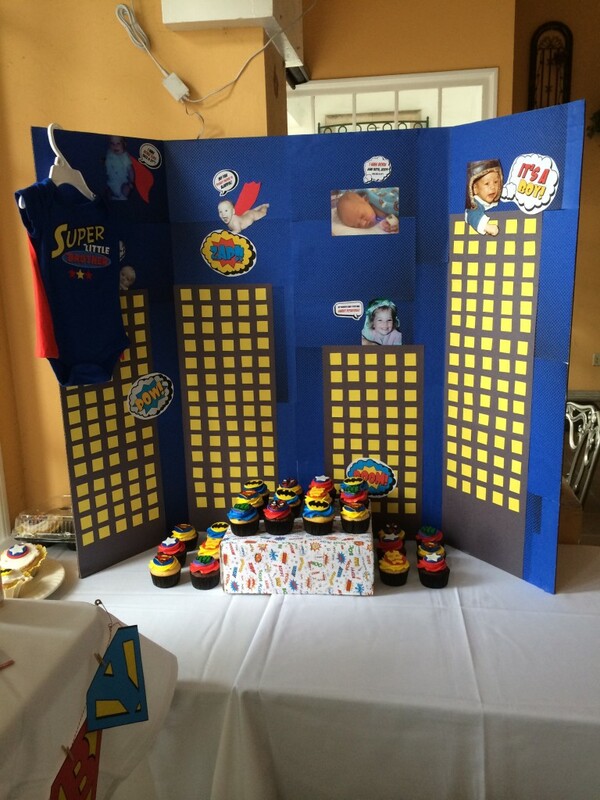 In January 2015 I helped my mother-in-law throw a Superhero themed Baby Shower for my sister-in-law. 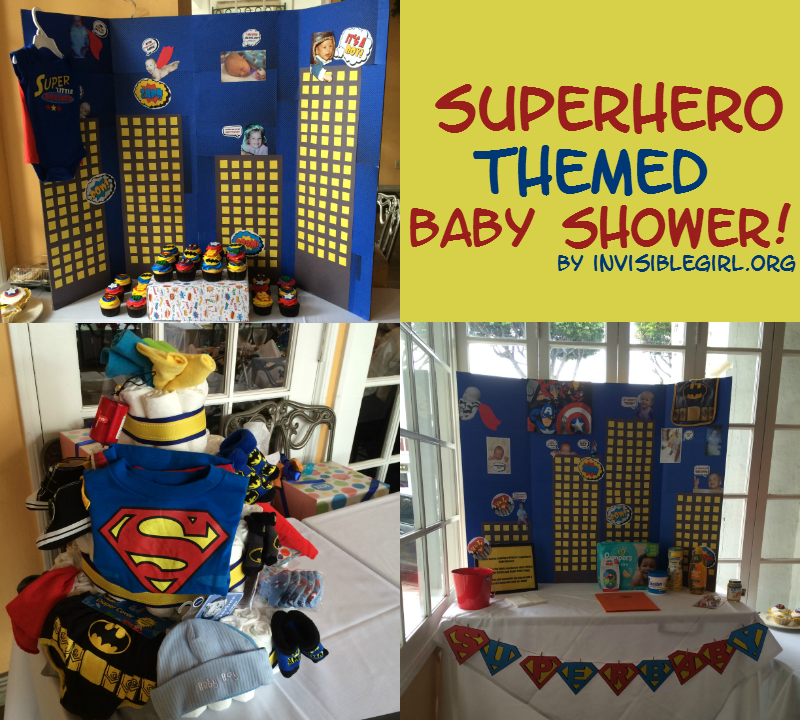 The idea came about when she asked her 5-year-old daughter what she thought they should name the new baby, to which she replied “Batman!” We thought that was so cute and funny that we decided to do a Superhero themed shower. I had to get a little creative with the decor. The shower was going to be held in a restaurant that wouldn’t allow us to hang or attach anything to the walls. I ended up buying a cute printables set from a seller on Etsy (that has since closed up shop :() that I used on a lot of the different items. Instead of a cake, we ordered some adorable cupcakes. The baker made Superhero logos out of fondant that were placed on each one. I placed the cupcakes on top of a shoebox I had wrapped in a printable from the set, just a bunch of comic book art like “Pow!” “Bang!” etc. For the background on this table I made a city scape posterboard. It was just a regular project board I got at Walmart. Some even come with colored backgrounds, I couldn’t find a blue one and plus the set had a cool ink background printable I printed on blue paper to give the sky some texture. The buildings were just black and yellow construction paper I cut into squares with a straight cutter. I got the grandmas to send me some baby facts about the parents and put those into speech bubbles that were part of the printable set. I got some baby pictures of the parents as well as the older sister and put the speech bubbles next to the babies. I also cut some capes to attach to some of the babies, to make them look like little Superbabies! I made another poster board backdrop here. Both posterboards had some superhero clothing and bibs hanging from them to add a little extra pop. This table had the items needed for the games and activities we had for the party. I pinned the bunting to the tablecloth. The bunting was made using the printable set and mini clothespins! 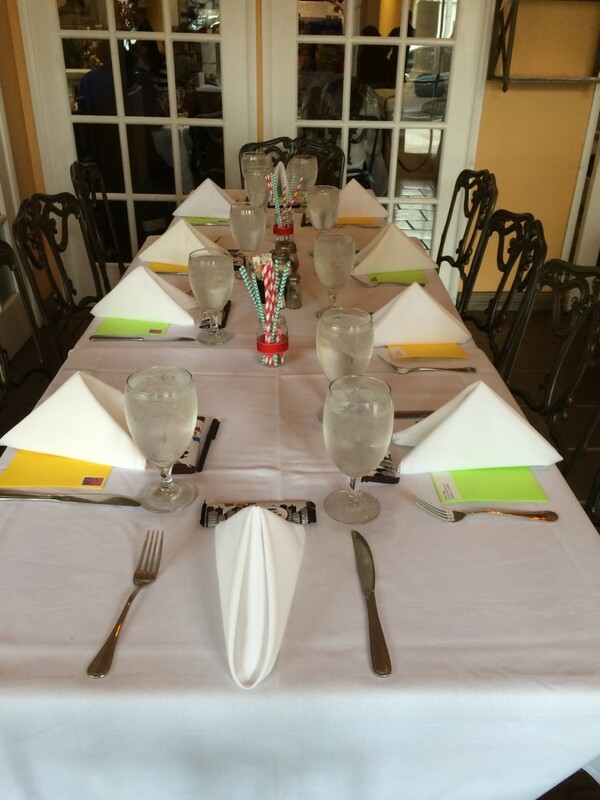 This was the table that guests would see as they first walked in. 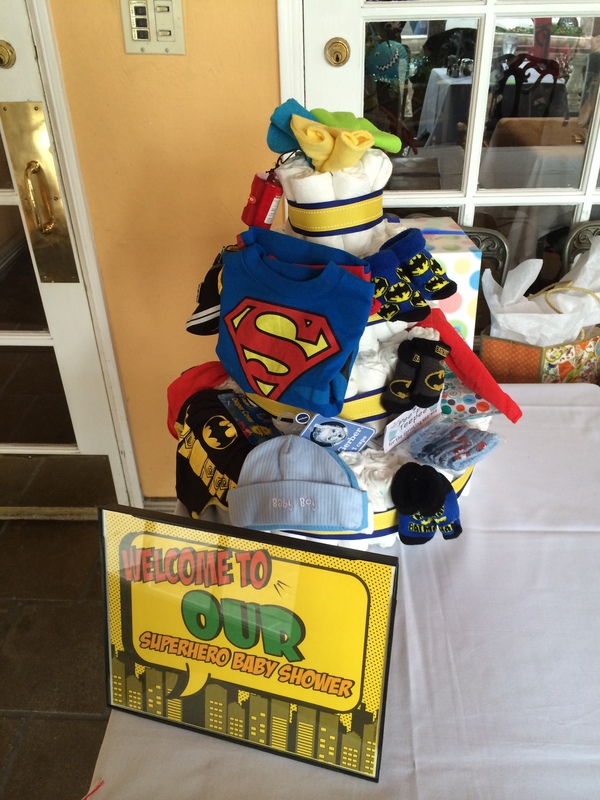 There was a sign (part of the printable package) welcoming them to the baby shower and also displayed the diaper cake. This was such fun to make; I bought an extra wide blue ribbon and narrower yellow ribbon and wrapped around each layer of the “cake.” Then I stuck in various superhero themed bibs, onesies, socks, shoes, etc as well as some brightly colored washcloths to finish it off. I loved how it turned out! I had a hard time coming up with Superhero-themed games so in the end I just gave up on that, lol. We played “The Price is Right” where everyone guesses the price of baby items displayed on the activity table. We also played a Baby Facts game, basically a multiple choice quiz of baby facts with some Superhero facts thrown in. Lastly, I had each guest sign or doodle on a square of muslin with fabric marker that I later assembled into a Superhero/Rocket Age themed quilt for baby. At each guests’ place setting, I had brightly colored envelopes with thank you cards inside. The envelopes were stamped and return addressed. I had each guest fill out their name & address and collected these for mom. All she had to do was write a thank you note, seal and stick in her mailbox, making thank you note writing as easy as possible for her. I also used some baby food jars (cleaned out and decorated for another shower I hosted) and stuck some fun paper straws in those. Lastly, we gave each guest a candy bar wrapped in a printable from the set thanking everyone for coming. The shower was a huge success and I was so happy with how everything turned out. It was a lot of work, but I saved a lot of money printing a lot of the decor myself instead of buying superhero themed merchandise. And having it at a restaurant was so nice, not having to worry about the food and beverage freed me up to concentrate on the fun parts! 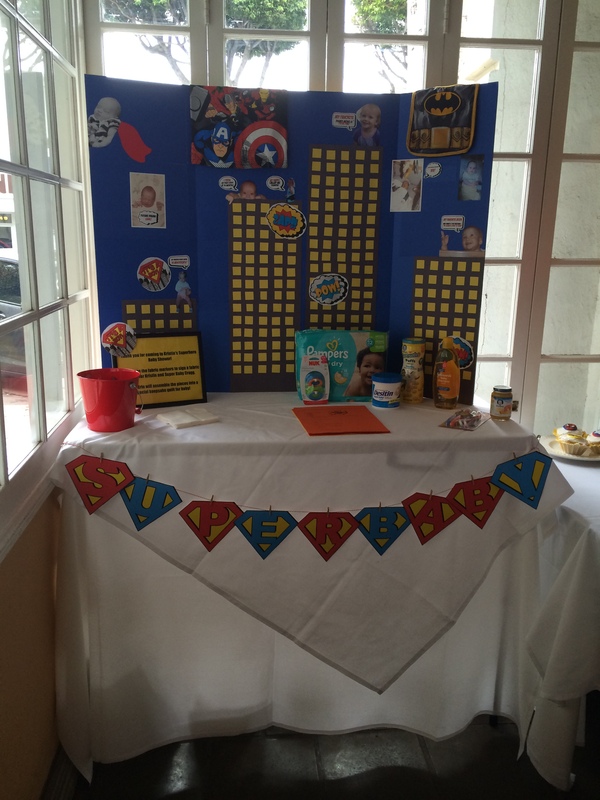 Hope this gives you some ideas for your Superhero party!